N. Mauricio Reznik is an attorney at Contreras Law. Mr. Reznik’s areas of practice include business and civil litigation, corporate formation, medical malpractice and personal injury. Mr. Reznik has successfully represented clients from inception of a case through trial. He has extensive experience in motion practice and has resolved numerous matters through motions for summary judgment and other dispositive motions. He has also negotiated complex settlements of litigation and has moved cases to resolution through mediation. Mr. Reznik is an honors graduate from Tufts University in Massachusetts where he studied Economics and International Relations. He earned his Juris Doctorate from the University of San Francisco School of Law. While at the University of San Francisco Mr. Reznik interned at the San Diego County Public Defender’s Office and the San Francisco District Attorney’s Office. He was also the recipient of the Best Legal Brief award from the University of San Francisco’s Moot Court academic program. Prior to joining Contreras Law, Mr. Reznik was an associate at Boyd Contreras, APC where he practiced business and civil litigation. 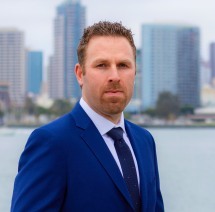 Mr. Reznik also has experience in the areas of personal injury, and dental and medical malpractice defense from his practice as an associate at the Goldman Law Firm in Tiburon, CA. Mr. Reznik was born in San Diego, CA and raised in Tijuana, Mexico. He is fluent in both English and Native Spanish. In his free time Mr. Reznik enjoys staying active by participating in running events and triathlons. He is also a member of Team Hoyt San Diego a non-profit that aspires to build the individual character, self-confidence and self-esteem of America’s disabled young people through inclusion in sports, running races, and triathlons.